May has been an awfully, awfully quiet month for me on the blog front – hubby and I have been travelling frequently, and just as we start to settle down into a pattern that remotely resembles a routine, we find ourselves packing for yet another road trip. It’s been a ton of fun, but understandably, takes me away from the blog quite a bit. 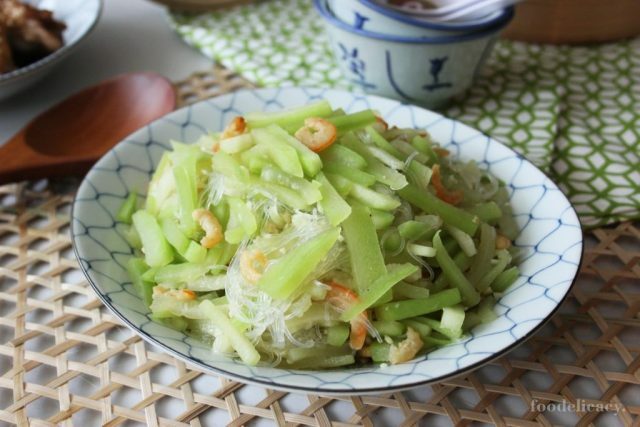 In a couple of days, we’re heading off again, so here I am, hoping to leave you with an easy Chinese recipe for stir-fried hairy gourd (mao gua) with mung bean vermicelli (tang hoon or glass noodles). This is a popular vegetable dish that is commonly served at economy rice (popularly referred to as chap chye png or mixed rice) food stalls in Singapore. Economy rice is not a specific dish in and of itself, but rather a type of food or food stall, where you’ll find anywhere between 10 to 15 troughs of cooked food, primarily, rice, noodles, cooked meats, seafood, vegetables, eggs and tofu, representative of local or popular cuisines. Talk about variety!! It’s easy and quick hawker food fare, and one that offers Singaporeans and visitors alike, quick, convenient, affordable, and delicious food options. You select any combination of servings of cooked food, which usually comes served with cooked rice. Hairy gourd is a very refreshing vegetable to consume, especially on warm days in our hot and humid weather, as it is considered to have cooling properties, thus harmonising the body system and helping to eliminate heartburn. It also contains rich amounts of Vitamins B and C. Hairy gourd is also very popular in Chinese cuisine when prepared as a soup (you can check out this popular soup recipe for hairy gourd with dried scallops). Hairy gourd (mao gua) would have to be my all-time favourite at these chap chye png stalls, and I particularly enjoy this Cantonese-style preparation where the hairy gourd is first stir-fried with garlic and fragrant dried shrimps, and subsequently braised in stock with bean thread vermicelli, until soft and tender to your liking. The mung bean vermicelli here becomes very tasty, as it absorbs the stock and vegetable juices that have been infused with the flavours of garlic, fried dried shrimp, and seasonings. This is a meal in and of itself, if you like, as mung bean vermicelli or glass noodles, is considered a main food grain that can replace rice or other noodles. In a small bowl, soak dried shrimps in warm water and set aside for 10 minutes. In a separate bowl, soak mung bean vermicelli (tang hoon) in warm water until softened, about 10 minutes. 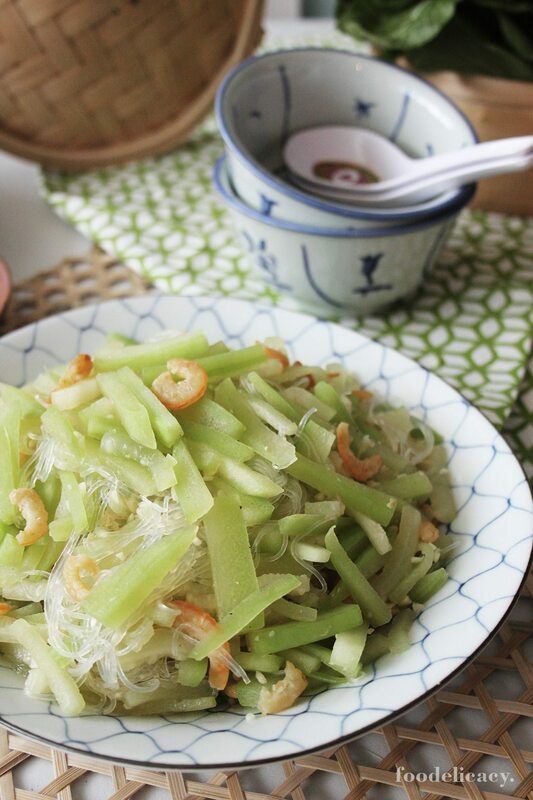 Drain softened shrimps and mung bean vermicelli. Meanwhile, peel hairy gourd, rinse and cut into thick, match-stick strips. Dissolve chicken seasoning powder in hot water to make instant stock. Heat up wok over medium fire. When wok is hot, add oil. Fry minced garlic until fragrant. Toss in dried shrimps, and stir fry until fragrant, and a little crisp. Put in the hairy gourd strips, and stir fry until softened. Add chicken stock and seasonings. Braise the hairy gourd until the gourd becomes soft (to your liking), then add the mung bean vermicelli (tang hoon) to cook for another 2 minutes or so, or until tang hoon has absorbed almost all the stock and juices. Dish out onto a serving dish and serve immediately. Hi Richa, that’s so nice to know! ?Thank you so much for sharing! I hope you like how it turns out, this recipe is one of my favourite ways to prepare it! I hope to have more vegetarian recipes on this blog soon too! Hi Celia! Trying hairy gourd for the first time…your recipe is very helpful; me being a vegetarian and all. Thanks!